The Yale School of Music presents the cellist Ole Akahoshi and the pianist Elizabeth Parisot in concert on Friday, May 4. 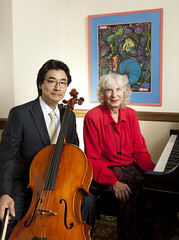 The concert, which takes place at 8 pm in Morse Recital Hall, will mark the close of the 2011–2012 season for the Faculty Artist Series. Akahoshi and Parisot will open with music from the Romantic period: Felix Mendelssohn’s youthful Variations concertantes in D major, Op. 17, and Johannes Brahms’s expansive Cello Sonata in E minor, Op. 38. The second half of the concert explores music of France and Spain, beginning with the Cello Sonata No. 2 in F major, Op. 123, by Camille Saint-Saëns. The evening concludes with Manuel de Falla’s Suite populaire Espagnole, a set of six popular Spanish songs arranged for cello and piano. Cellist Ole Akahoshi from Germany has concertized on four continents in recitals and as soloist with orchestras, including the Orchestra of St. Luke’s, Symphonisches Orchester Berlin, and the Czechoslovakian Radio Orchestra. Winner of numerous competitions including Concertino Praga and Jugend Musiziert, Akahoshi’s performances have been featured on CNN, NPR, Korean Broadcasting, WQXR, and numerous German radio stations. Akahoshi has performed in Carnegie Hall, Avery Fisher Hall, Kennedy Center, Suntory Hall (Tokyo), Seoul Arts Center, Wigmore Hall, and Berliner Philharmonie. He has made recordings for the Albany, New World Records, CRI, Calliope, Bridge, and Naxos labels. Akahoshi studied at Juilliard, with Aldo Parisot at Yale, and with Janos Starker at Indiana University. The principal cellist of Sejong Soloists, Mr. Akahoshi is on the faculty of the Manhattan School of Music and the Yale School of Music.